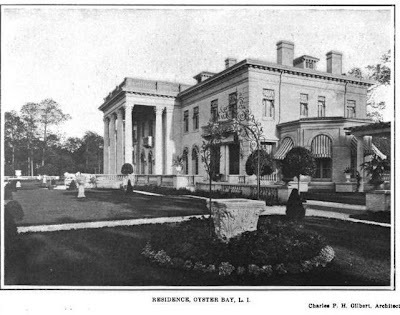 'Meudon', the estate of William Dameron Guthrie designed by C.P.H. 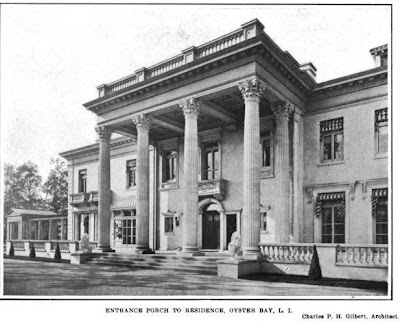 Gilbert c. 1900 in Lattingtown. Guthrie, a very prominent New York lawyer, became a member of the bar in 1880 and ran a general practice for close to fifty years. He was involved in numerous important cases around the turn of the 20th century. He was mayor of Lattingtown at the time of his death in 1935. The property was later subdivided and the house eventually demolished. Click HERE to see more 'Meudon' in B&W. Click HERE to see the ruins of 'Meudon'. the old lady in Maine. Stanford White was killed in 1906 so the only place he was living in the '20s was the cemetery. Thaw was incarcerated in upstate NY (Fishkill). 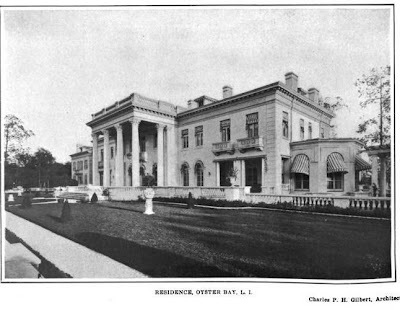 White did have a home in St. James on Long Island. I was told by a fairly reliable source that Mrs. Guthrie sold the property to a developer in the 1940's, retaining the right to live there for the remainder of her life. As she was in her mid 80's at the time, it clearly struck the developer as a reasonable request. She lived to be over 100, still at Meudon, with the house crumbling around her. William Guthrie was also a devout Catholic, but embraced Episcopalianism when he married Mrs. Guthrie, a divorcee with a husband still living. he was instrumental in the building of St. John's of Lattingtown Church, next to Meudon, and Mrs. Guthrie donated the large stained glass window at the altar. When her first husband died, however, and the Roman Catholic church agreed to bless their marriage, Mr. Guthrie abandoned the Episcopal church and resumed Catholisism. On another separate note, I gather that Guthrie was badly hurt by the depression: shortly after his death, the NYTimes reported that his New York townhouse on lower Park Avenue had been foreclosed on, and old timers remember that the estate fell into a woeful state of disrepair. Makes one wish striped awnings would come back into style. They give the house the look of a musical comedy. And I mean that in the best way. My heart hangs a bit heavy when I read that these lovely houses were demolished, especially when one sees the larger houses built in the last twenty or thirty years, which are ghastly. As always, AesthetesLament has a great point, and this time it's striped awnings! Indoors as well, striped canvas garden rooms anyone? I do, I'll make it a post this week. Thanks for reminding me. Thank you so much. I have been reading so much about all that went on. He was shot 1909. You're welcome, but I would recheck whatever you're reading because he was most definitely shot in 1906, not 1909. 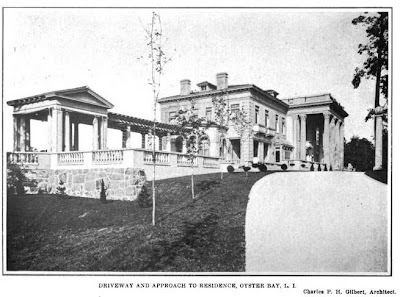 Anonymous is right: Sometime between these photos and the 1920's, large extensions were added on to each side of the house- making an already large house almost jaw droppingly enormous- and there were only three members of the Guthrie family- Mr. and Mrs. and her daughter, Ella Fuller Maullin whom Guthrie adopted. It's odd to think that not more than 15 years after this huge alteration, the house had already begun to decay. Do you know anything about these additions and the architect involved? anonymous again, no but i would imagine it was gilbert, customers who live in his works had a history of sticking with him for all their architectural needs. also this is a potentially annoying question but do u think with the extensions (remembering that meudon was 3 stories even know in most of these pictures the third story is not very noticeable) meudon was the biggest gold coast mansion other than oheka? I was looking at the Guthrie place on your site to compare pics with some of the postcards in my collection. My family on my father's side worked on several of the estates in the Locust Valley area, the Tully, Coe and Johnson places to name a few and were friends with other (mostly Irish) people on other estates, including the chauffeur on the Guthrie place. When the place was broken up in the 1960's, a beautiful fireplace apron and tool set from the Guthrie house were left at my father's--I have them now. The dairy complex was bought by the Armstrong family in the 1940's and they operated Armstrong's Dairy there until the 1970's keeping cows until the mid 1960's-I worked there in high school. Fields on other nearby estates were farmed for the cattle feed. After the cows were gone, milk was brought down from upstate and pasteurized and bottled there until the 1970's. The buildings are still there located off Peacock Lane and still owned by Frank Armstrong who has quite a few chickens and sells the freshest eggs around. Hi Tom, its late answering you, but hope you get my msg. My father worked as the chaffaur at the Guthrie Estate Harold Molin. He past away 1961, but I have photos tucked away. My computer is down so its best to call me at 1-631-223-5003. Regards, Karen Molin 4/14/2018.